Choosing the right quiver is just as important as getting the right bow, don’t you agree? We get it: Its primary purpose is to simply hold arrows, but that doesn’t mean that’s all there is to it. There are factors such as comfort and durability you need to consider before making your purchase. After all, each piece of equipment can add to your performance or hamper it. That’s why it’s important to learn about the different quivers and their diverse applications. Only then can you make the right decision of buying the most suitable one in terms of function and purpose. Below are a few recommendations with examples of the best recurve bow quivers at your disposal. Simply choose one that works for you. If you have a recurve bow and need to keep arrows on hand, 5 of them to be exact, this quiver is a good choice to go with. This is a fully adjustable quiver that allows you to mount it behind the bow sight. Although it can be easily mounted behind the sight, it also comes with a loop, so you can hang it on ground blinds or tree stands. This is a very lightweight and compact arrow quiver, one that you will barely notice having to carry around, and if we do say so ourselves, it actually looks pretty cool too. What is awesome about the APEX GEAR Game Changer 5-Arrow Quiver is that it can be used by both left- and right-handed people. What is also nice is the technical rubber hood inserts used here which help to reduce noise and will also not dull broad heads. This also helps to make drawing easier and faster. This quiver has a tension camlock that’s adjustable to provide you with proper balance during shooting. Since it’s easy to adjust it means you can mount the quiver behind the sight. It allows you to carry up to five arrows at a time. The mounting bracket can be adjusted up or down to ensure it fits all the bows. Because the rubber hood liner comes in a contrasting color, it makes it easier to load your arrows. The rubber hood inserts are also designed to reduce noise and vibration. It comes with a hanging loop in case you want to place it on a tree stand. This quiver will suit either right- or left-handed bow users. You might also like the coating which allows for a soft and comfortable feel. 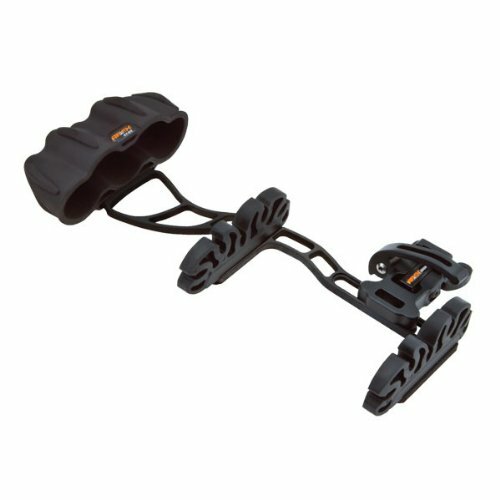 It comes with a universal mounting bracket that easily attaches to your bow. This quiver weighs about 3 pounds and isn’t the lightest model on the market but it’s still compact and easy to carry around. This is a cool hip quiver to go with. One reason why it is so convenient is because you can attach it to your hip just like you would a tool belt. This means that the bow you are using does not have to be specially designed to be able to mount a quiver, a definite bonus no doubt. The belt loop is adjustable, so you can make it however big you need for your body. The material here is an oxford fabric, which is both very strong and lightweight. Your arrows are not going to rip through it any time soon, plus it is so lightweight that you will barely notice it being on your person at all. It comes with 3 plastic tubes, each being 17 inches long and 1 inch in diameter. Each tube can hold up to 3 arrows, which is pretty good. Keep in mind that the Krayney Hip Quiver is for right-handed shooters, so if you’re left handed, you’ll need to look for another recurve bow quiver. This item also comes with a multi-functional storage pocket for accessories. This quiver has multiple pockets, so you can access your arrows with ease. You’re able to store your arrows in a systematic manner because of the three-tube design. The inside length of each tube is 17” and 1” in diameter. They’re made of plastic making them very durable and lightweight. It’s easy to carry because it features an adjustable waist strap which is simple to use. Apart from being hassle-free, the belt is easy to remove—simply make use of the plastic buckle. This quiver is specifically designed for right-handed archers. It’s made of oxford fabric and is available in camouflage, black, blue and red. 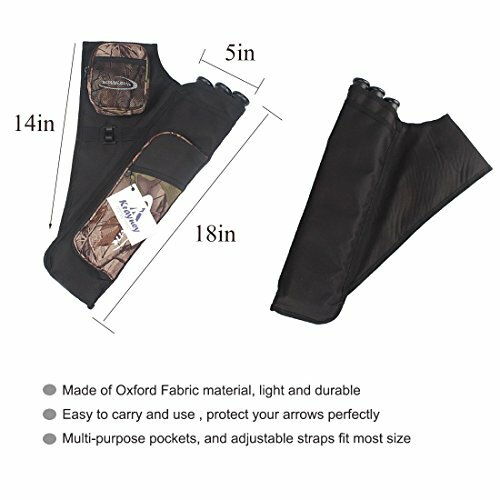 Overall this is an affordable quiver which holds plenty of arrows and it’s comfortable to wear and use. If you need a good archery quiver, this one is a really nice option to go with. We like the fact that it is made in the US, because this usually implies that there is a high level of quality. The high-quality polymer frame which the Treelimb Quivers Standard Quiver is made of is both very durable and lightweight. It is one of the best materials to use for a quiver. It is meant to reduce the noise and vibration caused by firing and drawing, which is essential for hunting. The Treelimb Quivers Standard Quiver features a quick-mounting and detaching system, plus it is adjustable, so you can mount it exactly as needed. 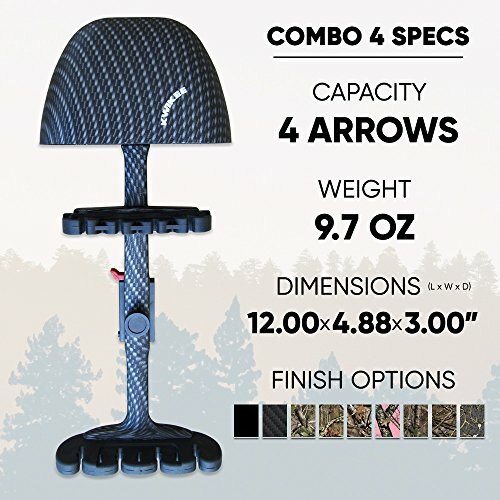 This item also comes with a patented broadhead capture system, which means that it can easily grip aluminum, carbon, and micro diameter arrows with ease. This item may only be able to hold 5 arrows, but it holds many different kinds and it holds them well. As mentioned earlier, this standard black quiver is constructed and assembled in the US and engineered with the utmost accuracy. It’s designed to withstand the pressures that come with intense hunting. Its frame was constructed using a supreme quality polymer ensuring exceptional performance. This quiver can handle vibrations associated with repetitive shooting from high speed bows. As a result, you can expect it to last long thanks to its solid and sturdy construction. The patented design allows it to grip carbon, aluminum and micro diameter size arrows. It features a quick detachable mounting system which can be adjusted vertically with ease. In addition, your arrows will be securely fastened thanks to its two angled locking positions. It weighs only 1.01 lbs., making it extremely lightweight and easy to carry around. The only drawback is it can only carry up to five arrows. The Kwikee Kwiver Combo Bow Quiver features a quick-detach system, so you can easily and quickly mount it on your bow, and take it off, without much trouble at all. This item is designed to be very lightweight, coming in at only 9.7 ounces, making it one of the lighter quivers out there right now. This quiver is also designed to be used with most shaft sizes, yet another convenient aspect. Although the Kwikee Kwiver Combo Bow Quiver can only hold 4 arrows, which is decidedly minimal, it still makes for a good hunting and training quiver. The special lock bracket system used here is perfect for high-speed shooting, to reduce noise, and to reduce vibration too. The foam-free and rubber-lined head cover ensures that arrow heads are not dulled and that expandable arrow heads do not open prematurely. Superior arrow retention is another big bonus here that you should know about. This four arrow bow quiver is ideally suited for both archery and hunting. It can also be used by archers shooting fixed blade or mechanical broad heads. Because of the weight, this unit is pretty lightweight and easy to carry and handle. It holds arrows securely at two points because of its dual rubber grippers. You can enjoy a relatively peaceful archery session because it features a quiet design that minimizes vibrations. As a result, it doesn’t rattle when shooting. The ultra-lock bracket mount allows for simple installation. In addition, you can easily attach and detach your quiver from the bow using only one hand. Unlike most bow quivers made of nylon, this one is made of shatterproof polymer which makes it very durable. You’ll like that it holds arrows securely and the quiver release latch works smoothly. However, one of its drawbacks is there’s no loop if you want to hang it on a hoop. Also, the hood is fairly shallow meaning your blades protrude while carrying. 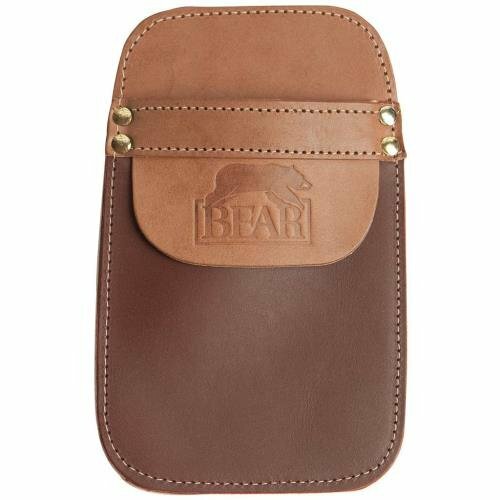 If you need a really basic but effective quiver, the Neet Fred Bear Pocket Quiver is a good way to go. This quiver is made of real leather, so not only does it look nice, but it has superior durability and tear resistance too. It can hold 6 arrows or more, depending on the type and size of the arrows. What is neat is that this quiver is designed to fit right into the back pocket of your jeans or other pants. Yes, this is a very basic quiver, one that is not specially designed to excel at anything particular, but it works well enough for basic purposes. Here we have a quiver specifically designed to fit in your hip pocket. It can also fit well in the back pocket of your jeans if you wish. Though convenient, you might want to add some kind of foam or fleece in your pocket for your protection. It’s made of two types of supreme quality leather as well as nylon stitching. Even though this takes up to 6 arrows, some may even place up to eight arrows inside. However apart from being uncomfortable it’ll end up hanging oddly. It weighs only 0.8 oz. making it super light and small. This quiver works well with the traditional triangular broad heads. The ideal quiver must allow for a comfortable and enjoyable archery experience. We feel the Treelimbs quiver takes the cup. Here’s why: Apart from being lightweight it’s easy to carry around. You won’t have to endure the vibrations associated with shooting arrows thanks to its quiet design. Not only is the construction sturdy but this quiver will last long thanks to its durable material. Also, it’s designed to hold your arrows securely in place. We believe its specs are exceptional. Is this how you’ll improve your experience on the shooting range?